I hope thread readers my be able to offer information on the following accidents for a friend of mine in South Africa who is assembling a data base of airshow related accidents and analysing the possible causal factors. A Mosquito in Staffordshire crashed on a hospital during an aerobatic display. 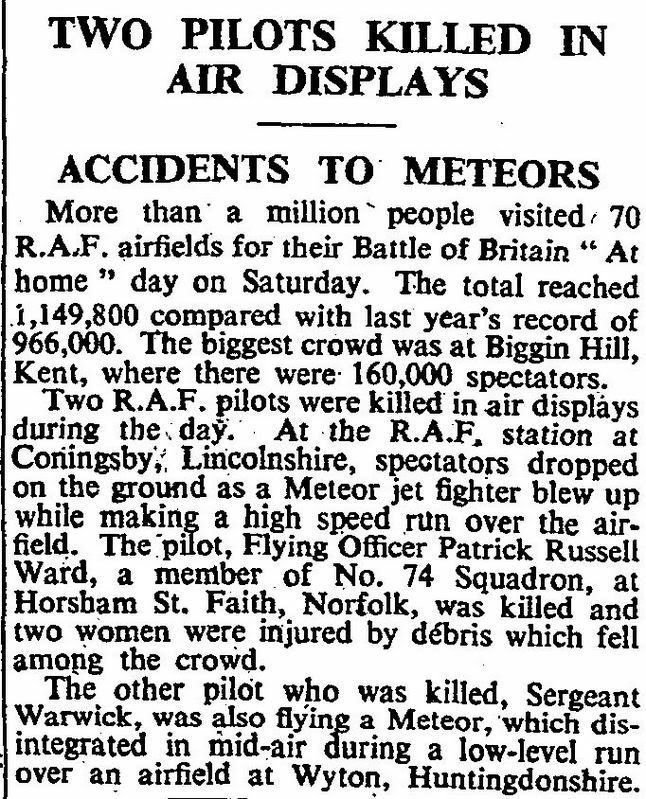 On the same day as another Mosquito crashed onto a hospital in Staffordshire, this time in Kent, another ‘Mossie; crashed into the crowd during an aerobatic display, tragically killing twelve spectators. PK322 Spitfire, 611 Squadron collided with PK523 during a display practice. Stalled while inverted during a flying display at Hullavington. Sideslipped into the ground during an air display Binbrook. A quirk of fate? Two Meteor F-8's from different air stations disintegrated during low runs at air displays, both on the same day. Stalled during air show at Greenwood NS. 19?? : In a co-ordinated synchro display at Farnborough between a Viggen and a SAAB105 in the mid 70s, the SAAB 105 did a wheels-up landing. Any contributions would be much appreciated. Last edited by G-KEST; 4th Jan 2008 at 21:54. Same question on the Flypast Historic Forum, where I have posted a couple of replies. I was at a RAF day at Waterbeach when about 12-13 years old, ie about 1953. I had cycled there from Cambridge to see the show. 4 Meteors were doing a formation display. I think they were in a box when the rear two collided. This may be one of the incidents in your list. The accident has been engraved on my memory all my life. I was standing, as it turned out, close to the mother of one of the pilots in the formation, although of course no-one knew until later which of them were involved. I remember one aircraft losing its tail end, and both crashing on the field and burning, with at least one parachute appearing to go into one of the fires. My mother still has, I think, a dated cutting from the local paper which I could copy and send, although not until I next visit her, which would be in the next 2-3 weeks. Afterthought: I'm losing confidence in the date of 1953...could have been well before that. I've just remembered that we moved from Cambridge well before then! They were 2 No 63 Squadron Meteor F.8's WB106 hit WE869/X at Waterbeach on 15.09.1951. G-KEST, if you would still like the cutting for your SA friend, please let me know. As a child I remember in the early 50s (I guess) a fatal accident of an Auster at an airshow at Boston, Lincolnshire. The aircraft was being demonstrated and it stalled and crashed into the bank of a drain beyond the end of the grass runway. (I believe that it had been doing a very low speed flypast). It was the first and only aircraft accident that I ever saw and it left a strong impression as both occupants were killed. Another list of accidents where information is required by my friend in South Africa. Help would be much appreciated. Crashed at Rempstone, Nottinghamshire during BoB display at Wymeswold. The wing of a Vulcan hit the ground after running out of fuel at a US Air Show whilst landing and then skidded into the Air Traffic Traffic Control. XM576. Detail required. Can’t find confirmation that it actually occurred! Internet extract without any substantiation! True or False? XT509 Souix AH1 (ARWF) collided with XW191 during a display at Christchuch Regatta. Detail as to cause and manoeuvre required. Yeovilton Navy Day Sep 1975 was marred by an unfortunate incident when the pilot of the Harrier was killed when the ejection seat fired while he was climbing out of the aircraft. Can’t find any substantiation of this accident! 15 APRIL 1975: XT242 Sioux AH1.Blue Eagles. ?? 1979: LOCKHEED F-104 STARFIGHTER (BINBROOK, UK). One of the first early references to G-LOC was in 1979. On the break to land after completing his display, the pilot was killed pulling the aircraft it straight into the ground. G-LOC was assumed as the most probable cause. Can’t find substantiation or date! Detail required. Cause and manoeuvre. G-MMXX Microlite, cr during display at school Fordingbridge. Crashed during a low level turn while practising for an air display. 1979 Starfighter crash at Binbrook - this may have actually been at Yeovilton as a West German Navy F-104 crashed fatally during the landing sequence at the FAA display there in '79. I do recall the Aldermaston Provost which I believe was G-BKOS. The AAIB report was published in Pilot, might be able to track it down if no one else can help. I was at the Yeovilton display with Lindsey Walton's Nord 1002 G-ATBG and had lunch with the pilot of the F-104 prior to his display. I flew my own slot shortly after the crash and vividly remember seeing the Starfighter pitch up uncontrollably during the turn onto final. A very unforgiving aircraft as the accident record showed. My own display was a rather subdued one after watching the tragedy unfold. The Provost crash involved a friend though his name escapes me. I recall his first name as Peter. He had been involved with the Leisure Sport team displays. It was a piston Provost rather than a JP5 though. Vulcan XH576 crashed at Scampton on 25th May 65 doing an asymetric roller landing using Nos 3 & 4 engines. All crew survived. "The co-pilot was to carry out an asymetric approach.... it flew along the left side of the runway ..... catptain took over and opened up all four engines"
"The left wingtip hit the ground, the nosewheel and port u/carraige collapsed and the aircraft slid into a carpark and struck the control tower." The cause was attributed to lack of rudder authority after the idling engines opened up slower than the live ones. This was the second Vulcan accident from a similar cause. It was Peter Newberry in the Provost who was also a BA 747 Captain I think. Many thanks for the reminder. Peter was a huge enthusiast. G-KEST, have you had a skim through the Vulcan, Metor and airshow incidents threads in the mil forum? Quite a few accidents/incidents recalled in those. The RAF Harrier pilot killed at Yeovilton is correct, I'm just trying to recall his name. He forgot to re-pin the seat and trod on the handle as he was getting out, the display jet was from the OCU and I think that he was the display pilot following Hoof Proudfoot. Steve Something? Actually, noting your location, you could nip over the road and ask. I was there and can confirm that a RAF Harrier pilot was killed. Can't confirm the date. Just remember seeing a body thrown into the air like a rag doll, and then realising it was an accident. Horrible. I seem to recall that the reason was given as the pilot was not paying attention, being in a probable state of semi euphoria after his display. There is a nice memorial bench to Pete at White Waltham. Re Victor breakup, IIRC, there was a crash at Cottesmore in 1961 at a display for the RCDS or IDC as it was. I have trouble here, for we were flying at the display but I did not see any accident. Maybe we were told about it. Maybe it was history. Anyway, the story as I remember being told it, was that the Victor had done a slow flypast and had cleaned up and was coming round for a fast run. A stiff crosswind was blowing him toward his line and to keep in front of the crowd he gradually tightened up the turn. At over 60deg bank the aircraft broke up. Has my brain finally crumbled or does anyone else recall anything like this? The harrier mate was Steve Beckley. From memory the F104 at Yeovilton was told by ATC to shorten his display , which he duly did. I think that is a different one to the G-Loc RIAB. I watched as the Hurricane swung out over the hills surrounding the airfield, rolled on its back and went into the ground vertically. Some say the engine had stopped?? who knows?